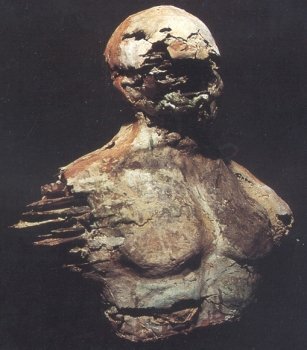 Sculptural pieces using a unique technique, mixing clay with combustible materials to create textures reminiscent of decay. Large sheets of clay with cotton linters. Dry to dry, soft to dry clay building. 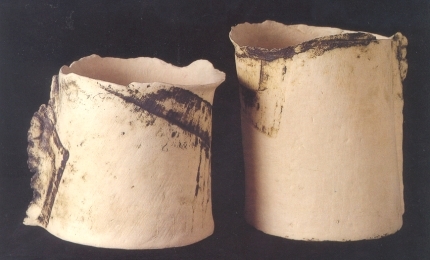 Methods of printing on clay. Also shown was the construction and firing of a paper kiln. 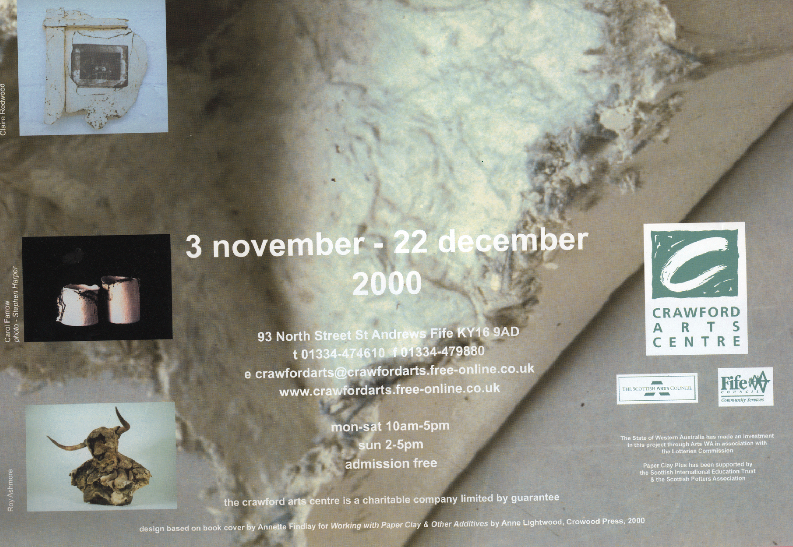 An Exhibition coincided with the publication of, and featured work by some of the makers from, the book Paper Clay and Other Additives by Anne lightwood (Crowood Press, July 2000). 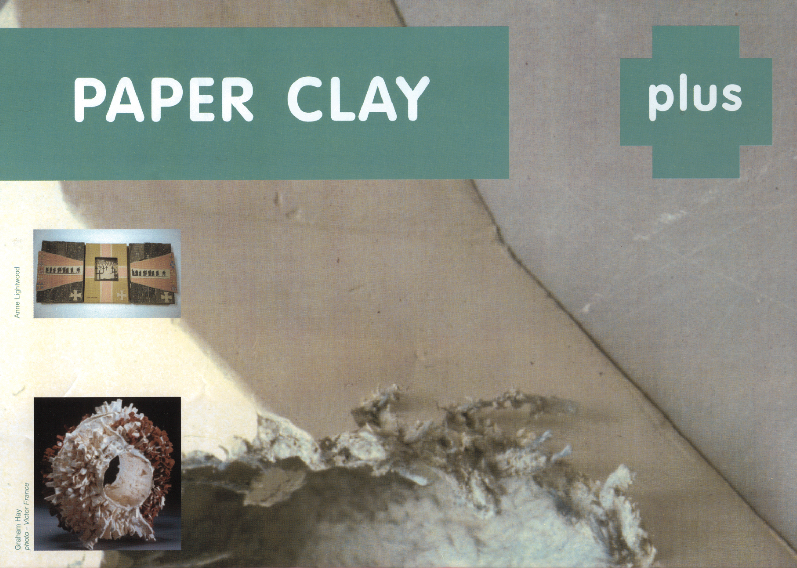 The book explores ideas and approaches to the medium, discovering why makers use paper clay in a particular way, as well as how they use it. It clearly shows the range and diversity of work being produced around the world using paper clay and it was important that this was also reflected by the exhibition. Roy Ashmore (Sutton Coldfield), Felicity Aylieff (Bath), Hannah Ayre (Edinburgh), Claire Brown (Huddersfield), Liz Cave (Gloucester), Sara Challinor (Dorking, Surrey), Shirley Eccles (Newbury, Berkshire), Carol Farrow (London & France), Lorraine Fernie (London), Tony Franks (Edinburgh), Fred Gatley (London), lotte Glob (Durness, Sutherland), lan Gregory (Dorchester, Dorset), Susan Halls (Connecticut, USA), Graham Hay (Perth, Australia), Brendan Hesmondhaigh (Huddersfield), Anne Lightwood (St Andrews), Polly Macpherson (Exeter), Angela Mellor (Booragoon, Western Australia), Frederick Payne (Frome Somerset), Suzhanna Perryman (Selborne. Hampshire), Claire Redwood (Bristol), Lizzie Rice (Surbiton, Surrey), Paul Scott (Wigton, Cumbria), Helen Smith (Cheltenham), Hazel Thomson (Solihull). A special thanks must go to Diana Sykes, her staff and army of volunteers who organised an outstanding exhibition and provided a healthy and tasty conference lunch.